Seven years. That’s how long the Cebu Schools Athletic Foundation, Inc. (Cesafi) has existed. And ever since it began, one school has dominated the league’s No.1 sport, basketball. Yes. Don’t call UV the University of the Visayas. I’m calling it by another name. Isn’t it fitting to call the school that’s won starting in 2001, won again the year after, won again and again until last weekend when it faced the University of San Carlos (USC)? And what did UV do last Saturday? In the season-finale? Game 5? It performed the one act that it performs best: It won again. How long will this seven-year undefeated run last? I asked. USC? I called Jay Ramirez, the head coach of the USC Warriors. His voice was hoarse but—like The Energizer Battery that he is during a game, always pumping his fists and waving those muscled arms, motivating them, yelling his warriors to fight on—head coach Jay Ramirez was upbeat. Yes, they lost, he said, but yes, they stood as winners. Last year, they reached the same Cesafi finals but lost 2-0. This year, they won Game 1, won Game 4, and almost toppled the UV giant. Rico is right. David almost slayed Goliath. With centers as tall as 6-foot-11 Greg Slaughter and 6-foot-8 Rico Berame, the UV Green Lancers were almost toppled by the smaller, quicker USC Warriors. And while the UV squad went undefeated from 2001 to 2004—not a single loss in the regular season nor the playoffs—this ‘07, they lost four times. A sign that the underdogs—the Davids—are hurting Goliath. 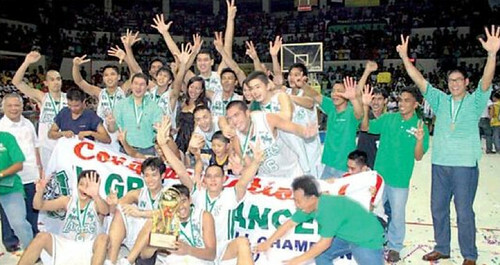 In all, 2007 was the best in Cesafi history—and maybe tops in all of Cebu collegiate history. When I watched the UV-USC Game 4 last Thursday, drums rolled, green and white balloons danced, shouts reverberated against the parquet floor, and sweat dripped from the faces of the thousands of spectators who swelled the Cebu Coliseum.